Moist, shaded woods. Increases with disturbance. Acer saccharum, Arisaema triphyllum, Fraxinus americana, Geranium maculatum, Ostrya virginiana, Parthenocissus quinquefolia, Prunus serotina, Quercus alba, Quercus rubra, Smilacina racemosa, Tilia americana, Ulmus rubra, Viola pubescens. In disturbed area associates include Allium canadense, Geum canadense, Osmorhiza claytonii, Phryma leptostachya, Polygonum virginianum, Sanicula gregaria. 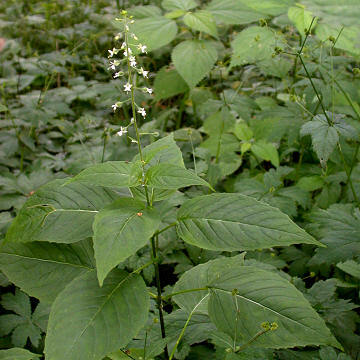 Interruptedly circumboreal; south in North America from Nova Scotia and southern Quebec to southern Manitoba, south to GA, LA, and OK.
Herbaceous perennial to 0.7-1.0 m. Leaves opposite, ovate, toothed, decreasing in size higher on the stem; pairs of leaves tend to orient perpendicular to adjacent pairs. Flowers in long terminal racemes; petals 2, deeply cleft to give the appearance of 4 petals. Seed round, oblong, covered in bristles that adhere to fur or clothing, and thus disseminated by animals. Somewhat inconspicuous except in fall when the seeds make themselves quite apparent to passer-bys.